The English Springer Spaniel is a medium-sized sporting dog with a most compact body, and a docked tail. His coat is moderately long, glossy, usually liver and white or black and white with feathering on his legs, ears, chest and brisket. 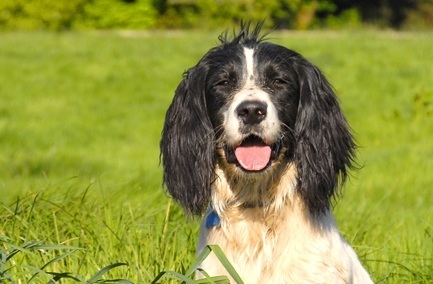 His pendulous ears, soft and gentle expression, sturdy build and friendly wagging tail proclaim him unmistakably a member of the ancient family of spaniels. The typical Springer is friendly, eager to please, quick to learn, willing to obey. In good condition should weigh about 49-55 lb. (22-25 kg). Distantly related to Cocker Spaniels, these dogs require more activity and stimulation than their smaller relatives. Behaviour is generally friendly but be aware of Springer Rage Syndrome that has appeared in some bloodlines. Overall healthier than Cockers, Springers suffer the same ear problems.